1. Walden, Henry David Thoreau. Walden has been on my "Want to read someday" list for years. It was $2.50. Who can pass up a deal like that? 2. Bleak House, Charles Dickens. I watched the fabulous Masterpiece Theater miniseries. Bleak House was on the sale table next to the checkout, so I added it to my stack. 3. How to Read a Book, Mortimer J. Adler. Another book on the "Want to read" list. It was even on my Amazon wish list, which I keep mostly so that I don't forget which books I want to read. And best of all, it was half the price I'd have paid had I purchased it new. 4. Drawing with Children, Mona Brookes. 5. Tales from Shakespeare, Charles and Mary Lamb. Another school purchase, probably a summer read-aloud. Many of Shakespeare's plays are retold in child-friendly language. I spent an extra five dollars for the edition in my photo because the text was larger and the book is illustrated. 6. The Kids' Nature Book: 365 Indoor/Outdoor Activities and Experiences, Susan Milord. School again. 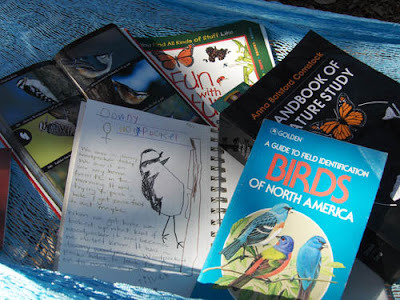 The Kids' Nature Book has short and easy nature activities for each day of the year. 7. My Antonia, Willa Cather. Another book off the "Want to read" list. From the book synopsis on Powell's website: "An enduring literary masterpiece first published in 1918, this hauntingly eloquent classic is an inspiring reminder of the rich past we have inherited. Willa Cather's lustrous prose, infused with a passion for the land, summons forth the hardscrabble days of the immigrant pioneer woman on the Nebraska plains, while etching a deeply moving portrait of an entire community." 8. The Way the Crow Flies, Ann-Marie MacDonald. An impulse buy. I've just started The Way the Crow Flies and it's marvelous. MacDonald has a knack for writing the ways a child's mind moves. 9. The Inheritance of Loss, Kiran Desai. I've also started The Inheritance of Loss, just barely. Rich and dreamy so far. 10. What Would the Founders Do?, Richard Brookhiser. A look at how our nation's Founding Fathers might have addressed some of the issues our nation is dealing with in modern times. I can't wait to read it. The Physics of Superheroes, James Kakalios. I thoroughly enjoyed reading The Physics of Superheroes. This book held my attention and piqued my interest. Kakalios uses examples from superhero comic books which got their science right to illustrate basic physics principles. He writes with humor and intelligence. It's well-written, fun to read and (at least as far as I can tell, which isn't very far) scientifically sound. I found the balance between the science parts of the book and the superheroes to be just right-- it's clear that The Physics of Superheroes is meant to teach physics, and the superheroes bits are to make it interesting and fun. I can't say that I completely understood all of it. Physics, once you get beyond the basic laws of force and motion, is a bit of a mystery. Bugs and rocks and plants, science that I can see and hold in my hand, I get. But the physics of atoms, for example, is still pretty fuzzy in my head even though I read and re-read those sections. Good thing loving husband took some basics physics classes in college, because I found myself turning to him and saying, "Explain this to me again," or "Am I understanding this correctly?" But, and this is the value of reading a good book on a subject that's entirely new, reading The Physics of Superheroes made me want to learn more. More about physics, that is. The superhero part was a lot of fun, but I didn't find myself wanting to run out and buy a Superman comic book. I did find myself wishing that I had the time, money and energy to take a physics class, though. I'd definitely recommend The Physics of Superheroes for anyone interested in physics, or in superheroes, or both. I'm not a morning person. 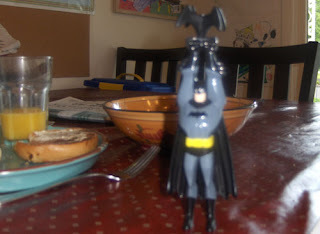 But at the beginning of the year I committed to taking kindergarten gent to the neighborhood school bright and early two mornings a week to take PE with a morning kindergarten class. The walk home from the school has been worth groaning my way out of bed on PE mornings. Fine young gent and I talk, really talk. He's a sharp and curious young man who asks lots of interesting questions and shares interesting ideas. The path to and from the school winds through a leafy neighborhood and along a bike lane behind a church. Every couple weeks, give or take, we discover something new that inspires us to explore. We saw a downy woodpecker one morning and spent half an hour poring over bird and nature books trying to identify and learn about the woodpecker we'd seen. Another morning we spotted our first robin of the spring. And last fall we got up on a sparkly cold day which we soon discovered (upon arrival at the school) to be a no-school day, but we saw a beautiful frosty spiderweb. This morning, fine young gent noticed as we passed beneath a tree the giant "star leaves" over our heads. I noticed helicopter seed pods on a stalk and plucked them. 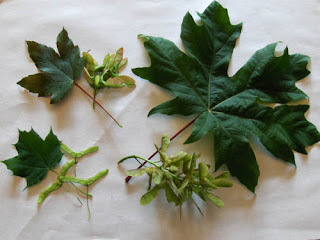 We found two more completely different maples on the way home, each with leaves and seed pods of different sizes and colors, but with the same basic shape. 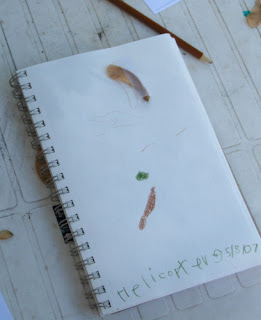 Kindergarten gent spent half an hour on his nature journal tracing, coloring, and comparing the leaves. Then we oohed and aaahed over what we saw under the microscope. I let him take some pictures of the leaves to print and paste into his nature journal. Fortunately, I took some myself first. Notice that this picture is much clearer than the picture of his journal. Somehow something got smeared on the camera lens. Which probably has nothing to do with the fact that while I was talking to his younger brother, this fine young gent was taking very close up pictures of his breakfast. This school year has been a wonderful adventure. In teaching my children I've discovered or rediscovered some of my own passions too, and it's been a joy to share those passions with my children, to see the joy and excitement light their faces, to hear them say, "Mom, can we get out the microscope?" and "Mom, look at this!" and "Mom, I just figured this out!" We've got a nature hike planned on Friday with some dear friends, and I can't wait to see what we discover next. Minivans are so domestic. So Mom-ish. So I've-given-up-any-chance-of-being-cool. Oh. Wait a minute. That was my pre-five-kids list. I love my minivan now. It's roomy, our whole family can fit, and I can fold the back seat down when I need to put something big back there. 1. 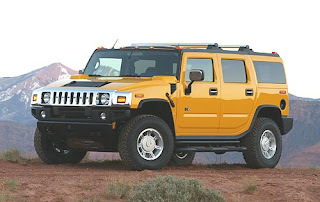 (For Real) A Hummer C'mon. Really. Do you need one of these to drive around town? That's it. I got nothin' tonight. I've been thinking all day, "What could I really and truly say I'll never own?" Maybe pumps with six-inch heels. I'd break a leg, plus who wants to spend that much money on shoes when I could buy books instead? And I'm sure they'd look smashing with my capri overalls from Old Navy. But I'm just too darn uninspired by my own list idea and still too sore from sleeping on a gym floor without my pillow to finish writing my list. Oh well. I'm looking forward to reading your lists though, those of you who write them. You choose. 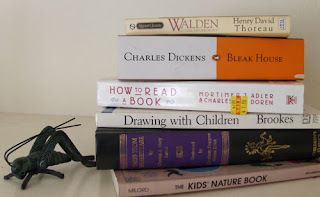 It doesn't matter what you write about as long as it's related to books. Need ideas? Here you go: Ten favorites, Ten books you hate, Ten books you'd like to read, Ten books you'll never read, Ten books on your shelf waiting to be read, Ten books you couldn't finish, Ten books you've read in the last year, Ten books my child loves that make me feel like screamingwhen I have to read them one.more.time. 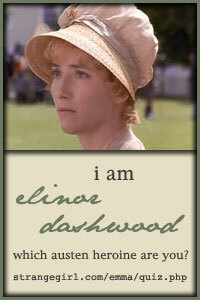 You are Elinor Dashwood of Sense & Sensibility! You are practical, circumspect, and discreet. Though you are tremendously sensible and allow your head to rule, you have a deep, emotional side that few people often see. I saw this Jane Austen quiz at Not Alone. I got the same result as Carrie. I am impulsive and impatient, and my singing voice is captivating, but unlike Carrie I cheated and re-took the test because I simply didn't think that Marianne was a good match. I'm not sure that Elinor is a good match either, but I'm not taking the test again. The concerts were beautiful. Our host choirs and their communities welcomed us and fed us wonderful meals. 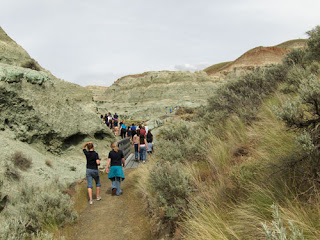 Best of all, on Saturday we visited the John Day Fossil Beds National Monument. 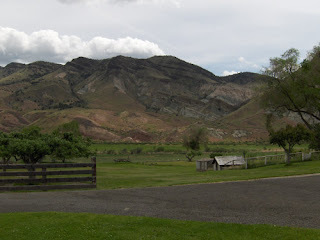 We picnicked at the Cant Ranch museum, with a lovely view of Sheep Rock. We met a real live paleontologist (that's him in the picture) at the Thomas Condon Paleontology Center and got to watch him painstakingly work at removing a fossil from a rock. 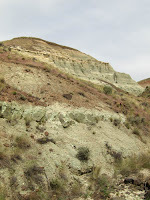 We went on a nature hike along the Blue Basin trail, which has an up-close look at the greenish rock you can see in the hills and has partially embedded fossils covered with glass display cases and left for hikers to see. One of the parents along on the trip is a geologist, so we had a personal tour guide at the bus mike, in the museum, and on our hike. 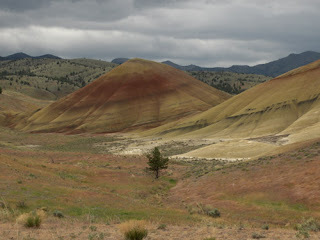 On Sunday we at our picnic lunch in the Painted Hills. Breathtaking. I can't wait until the gents are just a bit older so that we can spend a few days hiking and studying the rich geological history in this area. I would travel across the world to see what we saw this weekend. 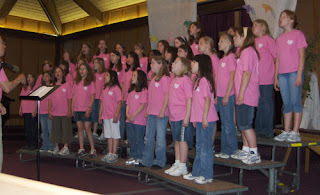 Thirty-some grade school choir girls. Lovely young ladies, all. I was responsible for four of them. Honestly, when I first saw my list, I thought, "Oh boy." I got three pretty challenging girls, one of whom was mine. It was a perfect match. They listened, checked in, looked out for one another. What a treat to get to spend time with them. I miscounted. There were eight concerts, six on the first day. The girls were pretty tuckered by the end of the day. All of the concerts were wonderful, but my favorite concert was the evening concert in John Day with their choir, the Little Singers. The girls were dusty from hiking, shirts untucked, hair unbrushed, clothes didn't match, but their voices were lovely and the audience was gracious and welcoming. Eight concerts. The Oregon Children's Junior Girlchoir also has a marimba band made up of girls in the choir, and they play at every concert. The marimbas are a real crowd-pleaser. The marimba girls know three songs, and the marimbas are by nature repetitive. On Sunday, the bus driver told us a story: One year he took his teen daughter on a trip with a friend. Every time she saw a Wal-Mart truck, she'd say, "I looove Wal-Mart!" He told us that for weeks afterward when he was falling asleep he'd hear that little voice: "I looove Wal-Mart!" He asked the girls to guess what he heard in his head the night before: The marimbas. I still have Gaudeamus Hodie playing in my head. (If you follow the link you can listen to the song, it's lovely and catchy.) I catch myself singing, "Oh, be joyful, Oh be jubilant" as I go through the day. Which isn't necessarily a bad thing to have playing in one's head, come to think of it. I miscounted here too. I didn't count the choir director, the geologist parent, the dad who drove the truck with the marimbas (and who bribed his daughter with ten dollars if she didn't cry the second night, which was worth every penny), the choir administrator/head chaperone, the choir parent in charge of feeding the girls (a dad), or the tag-along mom. What a lovely group of men and women. Aside from one woman who apparently had no idea that my lovely lady has a disability, and therefore thought I just have a kind of bratty drama queen, and decided to kind of take me to task about it, we all got along very well. The head chaperone is just a gem of a woman. She was kind, firm, and fun with the girls and with the chaperones, and really made the trip run smoothly. A big bus, equipped with a DVD player (thank goodness). And a lovely gentleman of a driver. He's been driving a tour bus for thirty-eight years. At the end of the trip the girls sang to him, and he thanked them because he'd enjoyed the trip so much. We watched several movies. The trip ended in the middle of Daddy Daycare, a movie I had no interest in watching. Now I want to know how it ends, so we may have to rent it next weekend. 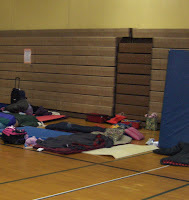 Two sleepovers, in sleeping bags, in school gyms with those thirty-some girls, some of whom have never been away from home. My neck still hurts. Next year I'm chaperoning the trip with the older girls so that I can sleep in a hotel. Lots of hiking and singing and giggling and watching movies and playing games. It was fabulous. I was kind of dreading the trip, but the girls were lovely, the hiking was fantastic, and the concerts were wonderful. Wish me luck. And that someone will bring me coffee in the mornings. We got our coffee every morning and lovely breakfast to boot. And it was wonderful. I'd do it all over again. Maybe not next weekend, but I'd definitely be up for another trip with this group, anywhere. Only I'd bring my pillow and an air bed. And earplugs. 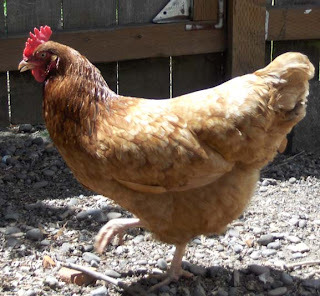 Tonight I walked Poppy to a friend's house to deliver eggs. This friend is a new friend, one of those charming and lovely people that we all wish we could be because she's so thoughtful and positive. She and I started talking about autism. Families of children with autism and children that we've known and worked with. She remarked that by now on my journey with our lovely lady with autism I've probably got a lot to teach other parents. "Yeah, what not to do!" I laughed. Compliments make me uncomfortable. "What would you do differently?" she asked. That's what I like about her. She asks real questions, and she really wants to know. I forget what I said except that it's hard to second-guess, and then told her some stories about lovely lady when she was little. But I kept thinking about her question. Maybe, if I could go back, I would worry less and enjoy my daughter more. Her early life was filled with therapies-- intensive one-to-one tutoring followed by three hours of preschool, a play therapy program at home, gymnastics classes and play dates. I don't regret the time or the therapies, but my mind was filled with therapy details. Planning for meetings and hiring tutors and teaching her myself and trying vitamins and making phone calls and reading message boards and gathering information. Worrying, and trying to do whatever I thought might help her. Then I second-guess my answer. I wouldn't change any of the therapies or activities, any of the things we did back then. So, what if I had worried less? I know that the worry, the fear of the unknown future and of my daughter's diagnosis motivated me to read, to research, to return to school, to throw my time and energy into filling her time with tutoring and therapies. Maybe we would have missed too many of those teachable moments and my lovely lady would be a different child today. Or maybe not. Maybe she would have come through shining and having faith that her own quirky self is exactly enough because we just let her be. Instead, if I could go back in time, I wish I'd had the perspective then that I have now. Confidence that life is good. Faith that God will give me what I need. Knowledge that I've got the strength and love and courage to see my lovely lady through whatever our lives together bring to us. Maybe with that kind of knowledge I wouldn't have made as many mistakes. But the only way to gain that kind of perspective is to walk the path. What it all comes down to is trust. As parents we have to trust our instincts and trust the path we've been given. Do what's right for our children. Forgive ourselves when we make mistakes. And, instead of laughing it off with a silly joke, say "Thank you" and mean it when someone gives us a sincere compliment. 1. Apples and bananas. By now my kids know this by heart: "If you want a snack, you can help yourself to an apple, a banana, or a piece of string cheese." 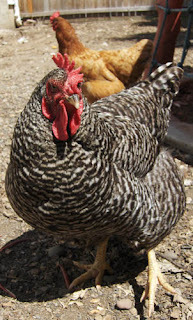 When they're snack mooching to see if the can get something tastier than the old standby they come ask me for a snack. I figure, if you're not hungry enough to eat something you're bored with then you shouldn't eat. I taught them this song: "I like to eat--I like to eat eight apples and bananas. I like to eat--I like to eat eight apples and bananas." Then we shout "A!" 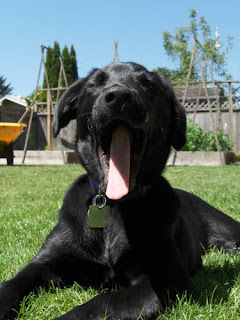 And sing "Ay Lake Tay Ate, Ay Lake Tay Ate Eight Aypples and Baynaynays...." And so forth through the five vowels. (Lyrics here.) This song is a guaranteed giggle for the fine young gents. 3. I can't be the only one with a secret chocolate stash. 4. Tortillas. They're great for wraps when we're tired of sandwiches for lunch, and quesadillas are a perfect quick dinner--melted cheddar for the young gents and sauteed veggies and leftover chicken with cheddar and a little pepper jack for the adults. 5. Salad Mix. Loving husband and I committed to having at least one green thing on the table at every evening. Salad is fast and easy. Usually we have salad on quesadilla night, and almost every other night too. 6. Yogurt. I like to make smoothies for breakfast, or serve granola and yogurt for breakfast or an afternoon snack, or serve yogurt for lunch. 7. Milk. We go through gallons of milk each week, and it's considerable less than it used to be because now that I'm neither pregnant nor nursing I no longer crave milk constantly. We make a separate milk run because the milk from Dari-Mart is fresher than that from the regular grocery store. 8. Chips and Salsa. The kids are on a salsa kick. 9. Random fruits and veggies. Whatever looks good. Asparagus when it's fresh, cantaloupe, watermelon, zucchini, berries when they don't cost an arm and a leg. Loving husband likes to visit the Tuesday Farmer's Market when it's in session and come home with surprises. 10. Bread. Bread for sandwiches, crusty bread for dinner. 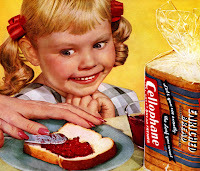 Five kids go through a lot of sandwiches. Thanks for the fun list idea, Lisa! Today was beautiful. Sunny and cool, perfect for working in the garden. With one lovely lady at her dad's and the other in Paris with her grandma, I declared today Garden Day for the fine young gents and myself, and out we went. We looked at our seeds, but that was all because everyone kind of wandered off, including myself. It was just one of those days. I wandered off to weed the strawberries and dig up the garden beds. 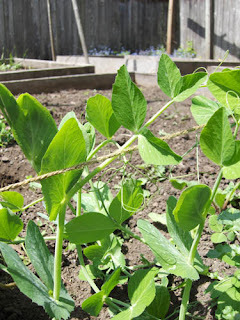 I started the peas twining up the string trellis. 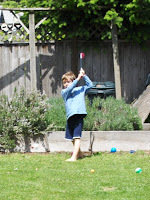 The older gents golfed across the yard while the youngest gent played with the baby doll under the tree and the puppy chewed on things and tried to steal my garden gloves or my trowel. Little black-tailed nuisance of a dog. Good thing she's cute. Look at this beautiful picture. Dirt. Beautiful dirt. 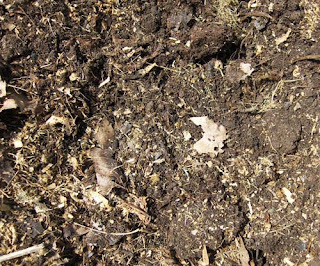 I turned the compost pile. It's hard to believe that just a few short months ago this was all melon rinds and apple peels and grass clippings and wilted lettuce and egg shells and leaves. And who knew a gal could get this excited about dirt? The younger gents came over to see what I was ooh-ing and aahing over. They started ooh-ing and aah-ing too, because I found the biggest earthworm I've ever seen. That worm was as long as my hand and as big around as my finger! I didn't mind at all until four-year-old gent decided that he really must bring the roly-polies into the house. Bugs are just dandy in their place, but I've got to draw the line somewhere. I used the iron-clad argument that the bugs don't know that you like them and want to keep them safe, and they'll be much happier in their home. Sit under the table and pet the puppy. The afternoon and evening were pretty much normal: Gymnastics for kindergarten gent, make dinner (spaghetti, salad, watermelon), choir parent meeting for lovely lady. 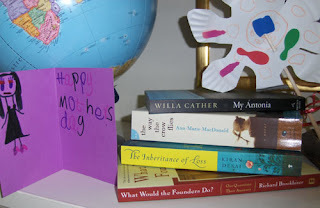 I did go to the bookstore to spend my Mother's Day gift certificate. I'll post my Mother's Day books tomorrow. Or the next day. Someday. I took Poppy for a walk when I got home, then tucked the gents in for the night. You should have seen those boys' feet. They're filthy. If I were a better mother I'd wash their feet before I tucked them, but they were pretty tuckered and so was I. Besides, in the grand scheme of things, dirty feet don't even register. I'm worn out. Off to hang out with my loving husband, then to bed for me. G'night. Obsession pays off once in a while. I believe that I may have identified Jim. 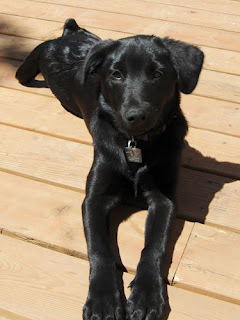 Except I'm changing her name (and gender) to Annabelle, in honor of her likely species, Vanessa annabella. Now tell, me doesn't this picture look like our mysterious friend, right down to the three yellow bands? (Scroll past the butterflies to the "young larva" picture.) While you're there, check out those beautiful butterfly eggs, only imagine that they're a gorgeous glowing blue. That's what our Painted Lady eggs looked like under the microscope. Annabelle will be a beautiful butterfly. 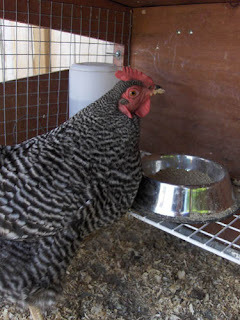 She'll look just like our Painted Ladies, except she'll have white at the bottom of her wings instead of orange. Lovely. Species detail for the West Coast Lady butterfly, aka Vanessa annabella, right here at Butterflies and Moths of North America. When I salvaged the caterpillars we'd hatched, this guy came in with us on the hollyhock I dug up from the strawberry bed. It's lovely, isn't it? It looks nothing like our butterfly garden Painted Lady caterpillars we got in the mail. And it's far bigger than any of the caterpillars we'd hatched ourselves, even the first batch. So we've got a mystery guest. I'm not obsessed with this caterpillar. Or with the whole butterfly project. Really, I'm not. So what if I dig weeds out of the garden and plant them for the caterpillars? So what if I've named the mystery caterpillar? So what if I spent almost an hour last night looking at caterpillar pictures trying to figure out exactly what kind of caterpillar Jim might be? 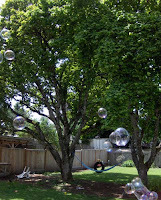 One of the most fun things about homeschooling is that I can share my obsessions, er, interests with my children. I'm having fun, and they're tagging along. So much for a child-led education. Seriously, I don't wholly believe in a one-hundred-percent child-led education. I do believe in a family-centered, interest-based education. Share and share alike. I take time to learn about farts (oh yes I did, and if you're lucky I'll remember to share some day) and do math with Legos and teach them about owls or wolves because those are their interests. And I share my interests with them too. 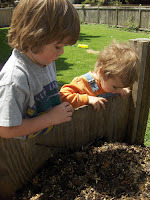 When they see me following a project more deeply they learn that learning isn't always imposed by Mom, nor does it have to be completely motivated purely by their own interests. They see that even adults like to learn new things. It's not so much that they're learning about caterpillars, it's more about learning as a challenge, as a joy, as a lifestyle. Or so I tell myself because it makes me feel better about naming the caterpillar Jim and calling him a "he." Look at him all curled up on his leaf. Ain't he cute? It's likely (after poring over hundreds of pictures) that Jim is a member of the Nymphalidae, or Brushfooted Butterflies, Family. 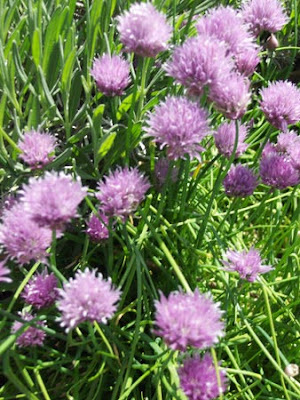 (Pictures here at Bug Guide.) He looks an awful lot like some of the Painted Lady caterpillars in the pictures, except they don't have those bright yellow bits. But caterpillars change each time they molt, so I think we'll just have to see who he is when he emerges from his chrysalid to be sure. What's This North American Caterpillar? Caterpillar pictures are divided by appearance: horny or spiny, smooth or bumpy, and hawk, or Sphinx, moths. There are also links to information about raising caterpillars and a caterpillar glossary. Bug Guide. It's not the easiest to navigate, but it's got lots of pictures and information. This is the site where I finally made a positive identification of the jumping spider that the fine young gents found in the back yard. 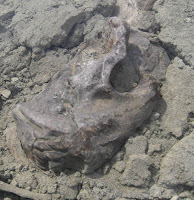 It had bright blue fangs and several beady black eyes . And they wanted to keep as a pet. Shudder. As a favor to those of you with spider phobias, I won't post a picture. Back to butterflies-- the Bug Guide butterfly page is here. If you click on the "Images" tab at the top of the butterfly section (or click over to the caterpillar page) you can see hundreds of pictures of butterflies or caterpillars. If you're obsessive, you can pore of the hundreds of pictures until you find one that matches your caterpillar or butterfly then click on the picture and it will tell you what you've found. Pictures are divided by species, which makes it a bit easier. This site has a neat interactive caterpillar guide. Check the characteristics of your caterpillar and you'll get a list of the most likely suspects. Caterpillars of the Pacific Northwest. Caterpillar information that will satisfy the scientist in you. 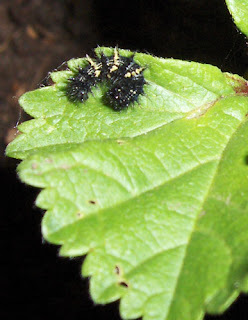 This site is very thorough and informative, and includes information on caterpillar morphology, caterpillar ecology, and raising and handling caterpillars. If you know the scientific name of the caterpillar's host plant, you can try looking it up at this site, HOSTS - a Database of the World's Lepidopteran Hostplants. As a last resort, I may try What's That Bug? These lovely folk will actually look at bug pictures people email and try to figure out what it is you've found in your garden or your bathtub or your hair or whatnot. If you're interested in bugs, check out the links on the side: Bug Love (mating bugs), Carnage (bugs eating bugs), or Bug Links. I Sing for the Animals. "All things in nature reflect their Creator. Everything tells us something about God." The first lines of the book. The facing page shows a still lake. I Sing for the Animals is a prayer of reverence for God in nature, accompanied by beautiful peaceful nature illustrations in Goble's distinctive style. Storm Maker's Tipi. A story of Sacred Otter and his son, who meet Storm Maker, Bringer of Blizzards. Storm Maker commands Sacred Otter to teach his people how to decorate their tipis. Storm Maker's Tipi is a lovely story in its own right, and the book also begins with drawings of the materials the Blackfoot people used to build their tipis, and ends with a photograph of tipis pitched in a Blackfoot summer camp, a template and instructions for building a paper model tipi, and tipi songs from the Lakota and Kiowa people. Crow Chief. A story of how Falling Star, a legendary savior figure, saves the people from starvation, and of how crows became black. The book finishes with songs about the crow from several different tribes. Buffalo Woman. A story of a young hunter who marries a lovely buffalo turned woman. She is shunned by his tribe, and so she returns to her people. This is a beautiful story, about love and acceptance, enhanced by the stunning illustrations. It's one of my favorites to read. Buffalo Woman literature lesson plan here. The Girl Who Loved Wild Horses. This book won the 1979 Caldecott medal, and deservedly so. It is absolutely lovely. The Girl Who Loved Wild Horses is the story of a young girl who tends the horses and loves them so that she eventually joins them. It was a favorite of horse-crazy lovely lady's when she was younger. All of Goble's books featuring Iktomi the Trickster are favorites with the fine young gents, and they're fun to read out loud. Iktomi is a trickster in Lakota legends, a common figure in Native American tales and legends as trickster figures are in tales around the world. But Iktomi isn't a clever wiley trickster, at least not in Goble's tellings. Iktomi is a slapstick figure, just plain not all that bright sometimes. My favorite: Iktomi and the Boulder. From Carol Hurst's Children's Literature site, Native American teaching ideas. A little dark, even after playing with Photoshop, but fine young gent doesn't mind about the pictures. He just loves to play piano. He had a recital two weeks ago, a piano audition today, and has his spring recital in two weeks. I am always amazed at his confidence. He gets up and plays as confidently as though he were playing on the basement piano in our playroom. Then he bows with a sweet sweet smile. He's absolutely charming up there on that stage. 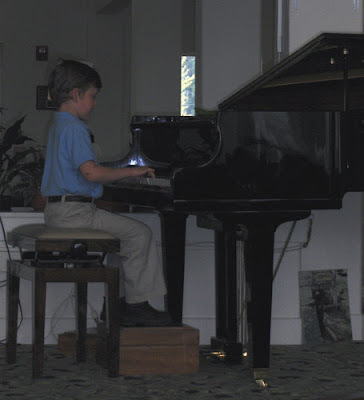 At this recital he played at a nursing home, and wowed all of the "grandmas." The woman sitting in front of us wanted to hug him and pat him, the ladies just wanted to touch his head and hold his hands. He smiled and chatted and listened to their compliments. My sweet heart gent. He gave hugs and high fives, and blew kisses to the grandmas. They glowed at him. Again, I was wowed by my gent's confidence and open heart. He told me later that he felt a little shy but he liked talking to the grandmas. He knew the ladies loved him and he let them, and he told me he'd like to go back and talk to the grandmas again. Our widowed neighbor, a lovely woman, told me once, "I spend most of my time with old people now. I hunger for little voices. " I send the ladies and gents over to visit every so often, and they love her. It makes me feel a little sad, knowing that in this wonderful life ahead of me there may come a time when I won't be surrounded by little voices every day. Reminds me to be just a touch more patient with those little voices and their "Mom-mom-mom"-ing. Look at that! Our Painted Lady butterfly eggs, those tiny glowing jewels, actually hatched into teeny teeny caterpillars! 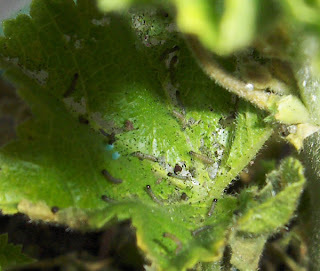 The leaves of the plant I dug out of the compost, common mallow, were absolutely covered with caterpillars. We looked at caterpillars under the microscope, we looked at the leaves they were devouring under the microscope, and we compared human, dog, and cat hairs while we had the microscope handy. We released a few leaves full of caterpillars into the garden. Two days later we couldn't see a single one, search though we might. Hmm. Of the caterpillars and their leaves, I wrote "were" devouring instead of "are." Our Painted Lady project met with a disaster. 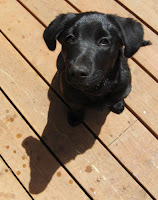 A four-footed, black-tailed, very naughty disaster of a puppy. The caterpillars really were devouring the leaves and needed a new host plant, so I dug up a thistle-y-looking plant, and another mallow so that we'd have a host plant known to be friendly just in case they hated our experimental plant. In the process we set free two more leaves full of caterpillars in the back corner of the garden. Unfortunately, lunchtime was looming, and the butterfly enclosure, now filled with plants and caterpillars, and the puppy were left outside. There was nothing left of our caterpillar project but a torn and very dirty butterfly enclosure. There's always a silver lining, though. Not only did we learn that Poppy can jump up to reach things set smack in the middle of the table, we learned what probably happened to the first set of caterpillars. Ants. Remember, we'd just put more caterpillars in the garden. 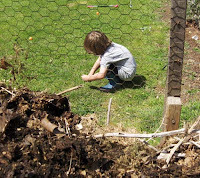 After picking up the mess I planted another mallow, then we went to salvage some of the caterpillars we'd just put in the garden. The plants we'd left them on were covered with ants. At first we didn't spot a single caterpillar, but suddenly we spied one on the underside of a leaf with three ants surrounding it. Aha! A real-life answer to kindergarten gent's question, "If they can make this many caterpillars, then why isn't the world covered in butterflies?" Ants is why. Fine young gent and I brainstormed about other predators which might think a caterpillar would make a delicious lunch. Between the few caterpillars we were able to save, a leaf with some unhatched eggs, and a few random caterpillars still crawling on the outside table, we may have managed to save the project from utter ruin, but only time will tell. Insect Investigations. PreK-2 insect lessons at Home Science Tools. For middle schoolers, check out Adopt-an-Insect lessons and activities at The Science Spot. Includes insect collecting instructions, puzzles, quizzes, and instructions for several insect-related lessons and projects. A very detailed Painted Lady and Luna Moth study from Earth's Birthday. Includes butterfly and moth study and comparison, butterfly journals, butterfly and moth anatomy and vocabulary, crafts, outdoor activity ideas, worksheets, links, and extension activities. Up for some general nature fun? Also from Home Science Tools, a nature scavenger hunt. I can't wait to try this with the ladies and gents. The weather here is gorgeous. 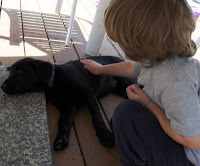 We brushed some of our planting mess off the table and settled on the deck for school this morning. At science time, we realized we're caught up on the butterfly study and our garden won't be planted until next week, so I got out the science kit we'd put on hold: Lights, Colors, Optics. Kindergarten gent and I looked at it. Hmm. On this sunny morning we just couldn't seem to muster up much enthusiasm for science. A maple seed helicopter came spinning down from the tree in our wonderful neighbor's yard. "Hey!" I said, "Wanna get out the microscope and look at the helicopters?" Gent's face brightened. Science enthusiam returned. He and his brothers are fascinated by the helicopters that come spinning down from our neighbor's tree every time the wind blows. We spent the next half hour drawing helicopters, taking them apart and looking at them in the microscope, and standing on a chair to figure out what the advantage of spinning seeds might be by dropping seeds with the tails torn off, then dropping intact helicopters. "It makes the seeds go farther!" fine young gent later dictated for me to write in his nature notebook. The crowning moment, for me at least, was about half an hour later when kindergarten gent pulled up two chairs and started repeating the seed-dropping experiment with his four-year-old brother. Priceless. The Journal of Maple Seed Science. From the site: "We hope you will show us connections between science, technology, design and society that the simple elegance of a whirling maple seed can inspire." Aeronautics: Maple Seed Helicopters. Make autorotating helicopters from paper. Includes an explanation about maple seeds and autorotation. Blowing in the Wind. An article about seeds and fruits dispersed by the wind. 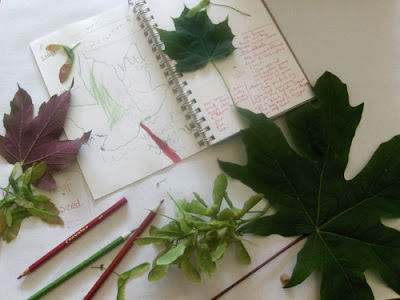 Maple Tree Identification. Identify major species native to North America. Includes drawings of leaves, bark and seeds. Origami Maple Seed. Entitled "Exploring Science and Design With a Maple Seed," this site offers more than an origami pattern-- there are also discussions of physics, biology, aerodynamics and more related to maple seeds. Whirling Wonders. Create your own whirling helicopter with paper. From the Science Museum of Minnesota. 1. Oh shoot! I forgot my ___________. Purse, camera, phone, papers, kids. Heh. Um, just kidding about the kids. Although I've got a couple stories. Maybe I'll save those for the Ten Things That Make Me a Terrible Mom Tuesday. If I'm lucky I'll remember whatever it is before I get to the end of our street. I wonder if the people in the white house on the corner notice that their neighbor from down the street always turns around in their driveway. The thing I forget most often? My list. Before I leave for the store I go around the house with a piece of paper. Toilet paper? Plenty. Paper towels? Put 'em on the list. Girls do you need anything? Toothpaste, on the list, and no, I'm not buying lip gloss or a tiara. Then I leave without the list. Doesn't do me much good sitting next to the telephone or on the dining room table or where I sat down to put on my shoes. Argh. 2. Oh rats! I need to call so-and-so. I don't have so-and-so's number in my cell phone, or my cell phone is dead. I think about all the people I need to call. By the time I get home I've completely forgotten all about so-and-so and the very important phone call. 3. I pretend I am a princess and I'm not really driving a minivan, I'm driving a flashy red sports car. While I'm at it I pretend that I'm in France and I have a flat tummy and buns of steel. And a nanny. No, a housekeeper, fulltime. And a crown. Not really. But it sounds like fun. Maybe I'll try it. 5. So there! Imaginary conversations with people always go so much better than in real life, don't you think? I've never lost an imaginary argument with loving husband. I am articulate, confident and right. 6. Darn it! I forgot to ____________. Switch the laundry, finish correcting lovely lady's science, eat lunch. Sensing a theme here? I remember a lot of stuff when I'm driving. 7. I wonder how gravity really works? I wonder why there are butterflies? What is red? I wonder if the universe is made of infinitely smaller and smaller (and larger and larger) particles, and somewhere in that infinite tinyness (or largeness) there's someone driving around in a minivan wondering if the universe is made of infinitely smaller and smaller (and larger and larger) particles. I wonder about a lot of stuff. 8. Wait a minute. Where are we going again? Sometimes I wonder a little too intently. 9. What exactly will get fine young gent to stop making that weird popping sound with his mouth? Oh. My. Goodness. I'm driving along and suddenly realize that I'm feeling tense. Irritable. Like screaming. Then it hits me. Someone has been humming the same phrase over and over and over and over. Or whistling through his or her nose. Or clicking teeth, clucking tongue, or just making some weird ungodly noise for the last ten minutes and I no longer have the mental energy to block it out and whoever it is needs to stop right now before my head just pops right off. 10. Driving. Just so you don't feel frightened driving in my neighborhood, I'll have you know that in between my mental wanderings I do actually pay attention to traffic and pedestrians and school zones and traffic signals and whatnot. To read more Tuesday Ten lists, or to link your own Tuesday Ten, click on Mr. Linky! Next Week: What do you always buy when you hit the grocery store? Ten Things In My Grocery Cart. Homeschool mom to two lovely ladies and three fine young gents, writing about the simple and delightful days in our journey through learning and life.